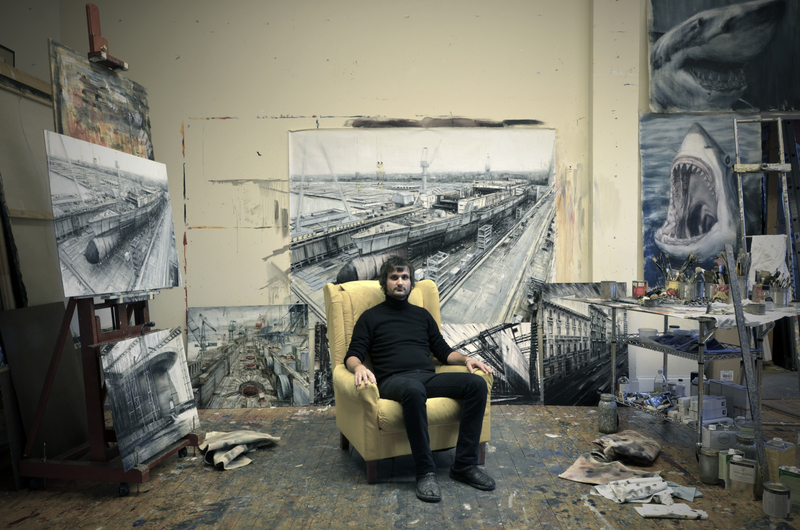 Valerio D’Ospina is a visual artist. It was never my plan to end up in the United States. This was one place in the world I never seemed to be interested in. When you grow up in another country, America is this great big ideal that seems almost too good to be true. I remember people talking about the American dream, and obviously the influence American culture has on the rest of the world, especially the entertainment industry, is momentous, but all the same, I never thought it was for me. As an Italian, I was fortunate to grow up in a beautiful sea-side town in Taranto with scenery that could shame the Caribbean and food most people can only dream of—especially the seafood. I received a solid education and attended an artistic high school that built the foundation and desire for my relocation to Florence to further my artistic studies. I received a BA and a MFA from the Accademia di Belle Arti in Florence, and am also fortunate to have no student debt to repay. This is another enormous advantage of being European. However, throughout the length of my studies, I met an American girl that altered the course of my life, and I soon began to think of the United States in a way I never had before. Initially, I moved to be with the woman I love. It was not an easy decision, but it was the one that made the most sense. As an artist, I can work anywhere. She, like many Americans, had student loans that needed to be paid and consequently, it is much easier for young professionals to find stable work in the United States than it is in Italy. We moved from Florence to her hometown, a small town near Pittsburgh, Pennsylvania. It was a place where I had lived briefly before, while teaching a summer course at the local university, but I never imagined I would live there for five years. The day I took that departing flight from Florence, I knew I was moving, but I hadn’t really admitted to myself that it was permanent. To tell you the truth, I am still not sure it’s permanent. We think often about one day moving back to Italy. I was only legally allowed to remain in the United States at that time for three months, so I had a return ticket to show at immigration control, even though I had little intention of using it. I married that American girl, and after five years in that small town, where I also continued to teach drawing and painting, we moved to Philadelphia. At this point, the lengthy process of immigration attorneys and green card interviews was thankfully behind us. I miss Italy every day. The food has been something that has been very difficult to get used to, along with many other small cultural nuances, but I also realize that my life as an artist would have never taken off the way that it has if I was still living in Italy, considering how poor the economy became after I moved. I am fortunate to have been influenced by two great societies and am constantly taking the best attributes from each culture and applying them to my life. I truly believe that moving to the United States, despite its difficulties, was ultimately the best thing for my wife and I professionally. We have made a good life for ourselves here and both continue to grow in our respective careers. In this aspect, it was absolutely worth it. I laugh to myself sometimes that I moved from Taranto, Italy, to its only twin city in the world, Philadelphia. Taranto is a very industrial looking city with a large steel factory and one of the largest naval bases in Europe. If you take away the fact that it is also the coast of one of the most magnificent seas in the world, it looks very much like Philadelphia. My art has always been very industrially driven and I paint shipyards and navy fields frequently. I spend a lot of time here at the navy yard in Philadelphia, and in some strange way, I feel a sense of comfort and proximity to my childhood home when surrounded by all of those majestically large ships. People ask me all the time where I would rather live, and it is a bit of a dichotomy in that when I am in the US, I am often full of nostalgia for my home in Italy; but every time we spend a significant amount of time in Italy, I can’t wait to return to my home in America. I am lucky to have family and homes in both countries, but my wife and I both have built successful careers in Philadelphia, so it looks like that is where we will be staying. For now at least.